The Butler Console Chest - European Black will become your favorite statement piece of furniture. 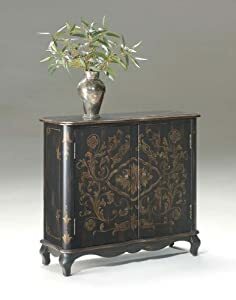 Made with selected hardwoods and wood products, this beautiful chest features two storage doors with a hand-painted design and antique brass-finished hardware. Dimensions: 36W x 12D x 32H inches.About Butler SpecialtyButler Specialty Company has been designing and manufacturing high-quality occasional and accent furniture since 1930. Each piece reflects Butler's dedication to enduring design, exquisite craftsmanship, and top-quality materials. This family-owned company is based in Chicago. They scour the globe in search of the finest materials and most efficient means of production, reflecting their commitment to providing excellent quality at exceptional value.